Silverback is an application for recording your screen during usability studies. When doing qualitative usability studies it’s a great idea to record your sessions with the users. Silverback is a software application made specifically for this. 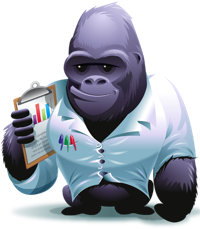 We purchased Silverback for our latest usability study of e-commerce checkouts. Here’s what we think about Silverback and recording your test sessions in general. Why even bother recording your sessions? Focus 100% on the session while it’s going on because you don’t have to take notes (you can just watch the session again afterwards and take your notes then). Keep an open mind throughout the entire session because this is not your only chance to take notes (so you don’t have to make conclusions along the way). Extract the very best screens and user quotes because you don’t have to do it during the session (this data makes it easier to convince the rest of your team about your findings). These recordings are obviously a goldmine when you start analyzing your test data. Silverback records what happens on the screen, what is being said during the test, and the test subject’s face (for reactions) using the laptop’s built-in webcam. Because Silverback uses it’s own format to store this data it requires little CPU so it won’t impact the computer’s performance during the test. Also, the screen recording is completely lossless. This means you can actually take screenshots of the video after the test and get the exact same result as if you were taking the screenshots during the test. If you have an Apple Remote you can also set markers in the video throughout the session whenever something interesting happens or is being said. This makes it easy to scan your recordings later on and quickly find the interesting bits. We did however experience a few problems with this feature. If you quit Silverback without stopping your recording first, the entire session is lost! The application should at the very least provide some sort of warning, or better yet, just save the recording so the data isn’t lost. Inserting markers during recording (using an Apple Remote) wasn’t stable in our case. It briefly interrupted several tests because the volume-up button is used for inserting markers (causing the volume-bezel to show up in the middle of the screen). While Clearleft (the company behind Silverback) did react and offered friendly support, the problem remains unresolved for our part. Silverback is a Mac-only application, so if you’re on a Windows machine, you’re out of luck. Privacy. You need to tell your test subjects you’re recording them, and you need to store the recordings safely. This obviously isn’t limited to Silverback, but related to any kind of recording of your test sessions. Overall we have been quite happy with Silverback and we will use it again. Hopefully the few issues mentioned above will be ironed out in future updates. If you’re on a Mac, we definitely recommend you try out the trail version. What do you think about recording usability sessions? Is it worth it? Authored by Christian Holst. Published on February 24, 2010. Thanks for trying out Silverback and glad you found it useful (with a couple of exceptions). To be honest we didn’t know there was a problem with capturing the session if you quit the application mid record as it’s not a behaviour we’ve seen before. However I’ve asked our engineers if they can fix that so hopefully it’ll be in the next release. The Volume issue is slightly more tricky and is actually a bug in the OS rather than the app. Our app requests and is granted exclusive control of the remote, so theoretically the plus button shouldn’t change the volume. However the OS isn’t honouring that contract and sometimes forgets. We’ve raised this as a bug with Apple and hope it’ll get fixed soon. It was actually the subject who quit Silverback while it was recording. It happened by accident while he was switching back and forth between two apps and closing tabs (cmd + w) but then accidentally hit “q” instead of “w”. It’s probably not something that will happen very often. I’m pretty amazed at how small a memory footprint you’ve been able to achieve. Usually screen recording software forces your laptop to grinding halt after 20 minutes of recording but Silverback handles 2+ hours of recording without a glitch. We’re excited about version 2 of Silverback app coming out soon.